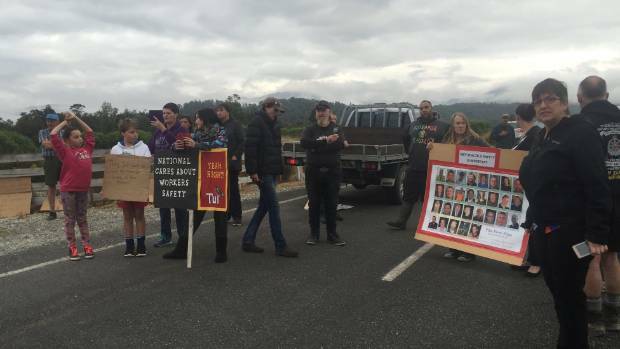 New Zealand: John Key Resigns – Unfinished Business at Pike River Mine – Coercion Code – "Dark Times are upon us"
Pike River families are calling on John Key to stop the sealing of the West Coast mine before he steps down as Prime Minister. Sonya Rockhouse, whose son Ben died in the 2010 disaster, said Key faced a choice about the legacy he left behind. “He can either do the right thing now before he goes, or forever be the prime minister who turned his back on our boys,” she said. Pike River families and supporters protest the mine being sealed and ask contractors to down tools. “We have expert advice that the drift can be re-entered to retrieve evidence of what actually happened down there, and our loved ones’ remains. All we want is the chance to do it, and he can give us that if he chooses. Key announced his resignation on Monday and will step down on December 12. Family members and supporters have been protesting at the mine access road since November 12 in a bid to stop Solid Energy permanently sealing the mine with concrete before the drift – a tunnel leading into the mine – is explored for remains. They say international experts believe a safe re-entry is possible and Mines Rescue are willing to do it. In response, Solid Energy directors have written an open letter which will be published in newspaper advertisements. The letter addresses a number of “inaccurate statements” including that inspection of the drift was safe, or that Solid Energy was sealing the mine because it was colluding with the Government in a cover up plot. It said the fatal risks included collapse of the tunnel and fire. It would need to implement at least 600 risk control activities. It said the seal would be five metres thick and had been modified to be technically reversible at the request of families. They were not going to change their plans because of “poorly informed commentators”. The 29 miners at Pike River Mine explosion in 2010 were all deliberately murdered, to facilitate Pike River Coal Ltd to collect a $100 million insurance pay-out, turn the public’s attitude away from underground coal mining and reduce opposition to open-cut mining, and allow BATHURST RESOURCES LIMITED (at the time registered on the Australian Stock Exchange but now dually listed) which foreign bankers also secretly control with Pike River Coal, to overtly come into New Zealand and buy up all of the country’s coal resources and then open cut mine it – which has by now almost been fully completed! Interestingly, Dr Cohen mentions in great detail with references from Bathurst’s own website, that just before the explosion in the mine, BANK OF AMERICA was aggressively buying up shares in Bathurst Resources Limited. Guess who was working for Bank of America before he became NZ Prime Minister. 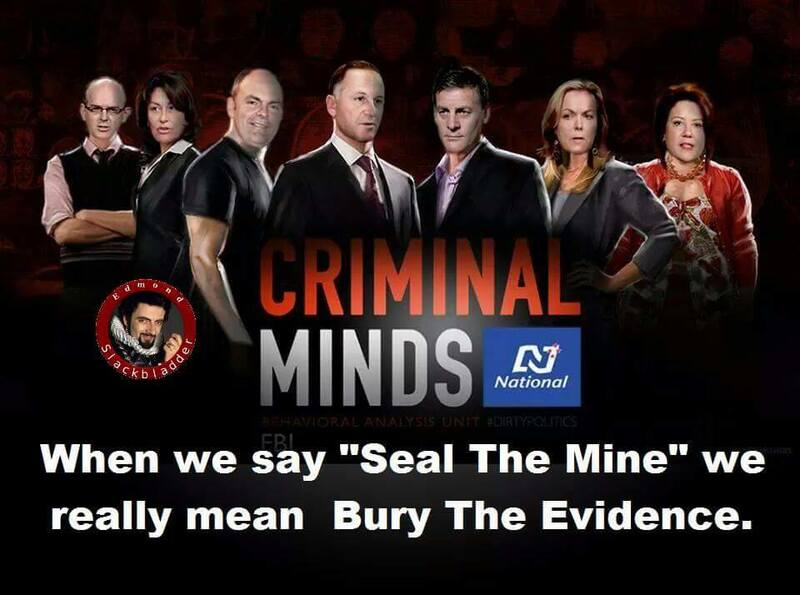 COLLUSION BETWEEN THE DIRECTORS OF PIKE RIVER COAL LTD, THE DIRECTORS OF THE BIG SHAREHOLDERS OF PIKE RIVER COAL, THE NEW ZEALAND GOVERNMENT, THE NZ PM, THE NZ MINISTER OF POLICE, THE NZ JUDICIARY, THE NZ INTELLIGENCE AGENCIES, THE ROYAL COMMISSION INTO THE PIKE RIVER COAL MINE DISASTER, THE MAINSTREAM MEDIA AND THE FOREIGN BANKING CRIMINALS THAT CONTROL THE LOT AT THE TOP – has ensured the New Zealand public have been totally brainwashed about the true facts of this monstrous crime and cover-up. And just to make sure the mine victims’ families, or the general public can’t ever know the full truth about the crime, or even get into the mine to inspect the crime scene, and can’t sue the Government, the companies or Pike’s criminal directors, the spurious rat and High Court Judge heading the corrupt, Royal Commission of Inquiry – according to Lawrie Drew, HAS EMBARGOED ALL THE CRITICAL EVIDENCE FOR 75 YEARS! And yes, this has all been totally censored by the incredibly vile, corrupt mainstream media! This means, in simple man’s terms, that the corrupt lawyers and judiciary involved all now know, that when for example the Government Department supposedly that wanted to bring CEO of Pike River Coal Peter Whittall to trial under Health and Safety laws (actually it was just a pretence because they all knew that it would fail) all that Peter Whittall’s legal counsel had to say to the judge in the pre-trial hearing was: “Your Honour, as all the critical evidence has been been embargoed by the Royal Commission for 75 years, we cannot get disclosure and my client cannot defend himself against the allegations because all the evidence is being kept secret and cannot be accessed.” Judge: “Case dismissed. This therefore means that the NZ Government, police, the judiciary etc. at least at the top – ALL KNOW they are a pack of lying criminals, including the drafters of this latest “Open Letter FROM THE DIRECTORS OF SOLID ENERGY. Apparently, PM John Key was personally given a copy of Dr Jacob Cohen’s mind-blowing book so he can’t say he was not informed. Isn’t it rather strange to see he is abruptly resigning around the same time they want to seal up the mine. Finally they want to seal up the entrance to the mine with a 30 metre thick plug of concrete. 30 metres! Can you believe it? They sure do want to make sure nobody ever investigates the crime scene don’t they? In the United States of America a similar coal mine explosion occurred at the Upper Big Branch Mine not long before Pike River explosion when exactly 29 miners were also killed. Since then, the miners’ families have received millions of dollars in pay-outs and the CEO of the company concerned Don Blankenchip is now in jail. Yet here in New Zealand, not even one director has even been charged or brought to trial. We hear about the criminal activities of government agencies in the United States being bad, but our government and corporate criminal cabal is a hundred times worse! 29 miners cruelly killed, and yet nobody has even received a slap on the hand. What an utter disgrace. Frankly, if we just sit back and put if with this rot and say nothing about the blatant lies being perpetuated by the mainstream corporate media propaganda goons, nearly five million of us, seriously, I fear for the freedoms and liberties of every single person in this country. Isn’t it about time things changed dramatically? Truly. There are copies all over the net – this document won’t be going anywhere. If you haven’t read it, please do.The book is not hundreds of pages. There is a copy on this site. Just click to enlarge the images. They were scanned in to keep it in it’s original form. Democracy in NZ is now a dictatorship using the cover of democracy-a very thin veil indeed. And one could ask-what about Allan Hubbard?The MSM have the gall to talk of fake news when for the last century they are the purveyors of such.They have aided and abetted this criminal activity.More and more the stench rises and the rats jump ship.The MSM have aided and abetted these crimes with their fake news/half truths/lies-spinning spinning spinning to caver their asses.The people are more and more smelling this stench.The war on truth has never been more intense.